"Sunday Brunches off the Beaten Path"
Living in Ocean Springs it’s hard to believe that off the beaten path lies a hidden gem of a restaurant. "Lagniappe" Louisiana French for, "a little something extra" is certainly an appropriate name, yet understated, for this enchantingly cozy restaurant. It was highly recommended by an acquaintance, so when Patsy & John Switzer cordially extended an invitation for us to review their "Champagne Brunch", we were intrigued to find out if this establishment lived up to its recommendation. Arriving Sunday morning, we were greeted with a warm welcome from Patsy and her staff, as if we had known them years. However, don’t be misled into believing we were treated differently due to this review, Lagniappe has become legendary among the locals not only for the fine dining, exquisite ambiance, excellent service, but most of all for a memorable experience. Lagniappe offers elegant dining with a casual feel. It is romantic enough for couples, yet friendly enough for a family to enjoy their dining experience. To add that visual touch of class, tables are displayed with crisp snow-white linens, wine goblets and a vase of fresh flowers. The walls are adorned with awards and previous reviews proudly displayed amongst the colorful & appealing pieces of art by local artist. 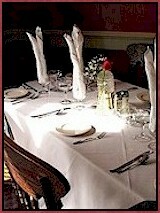 Certain elements of a restaurant owned and operated by a husband and wife simply can’t be duplicated. Opening Lagniappe was a dream that became a reality for this couple, but has truly become a prominent feature of the city of Ocean Springs. An evening out or a Sunday brunch is all about creating reminiscences of connecting with family or friends over good food. This definitely is an establishment that has lived up to its recommendation. Therefore, OceanSprings-MS.Com is proud to honor Lagniappe Restaurant with its "Community Excellence Award" for its immeasurable contribution to the community of Ocean Springs.